Theme parks are always a good thing to do whenever you're blessed with a beautiful, cloudless Saturday in Orlando. With the recent Spring Equinox, what better time to get outdoors and breathe some fresh air than the first official weekend of spring? The flowers are blooming, the sun is shining, people are out running... and so are their noses. Me and my seasonal allergy-afflicted family weren't going to let the sniffles get in our way, so after sharing a bowl of Honey-Nut Claritin for breakfast, we were ready to bring on the flowers! 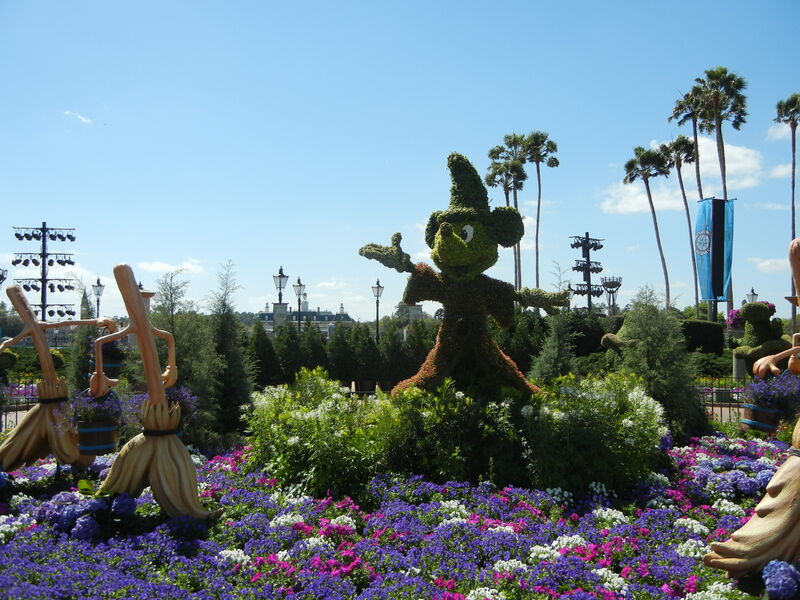 During the annual EPCOT International Flower & Garden Festival, the park is littered with colorful, flowery displays that showcase Disney characters in action. Scenes from classic Disney films are brought to life by talented, green-thumbed designers. Edward Scissorhands would be proud. For those unfamiliar with the park, EPCOT is shaped like an inverted eight, with Future World at the front of the park and the larger World Showcase bringing up the rear. Future World is split into East and West sections. 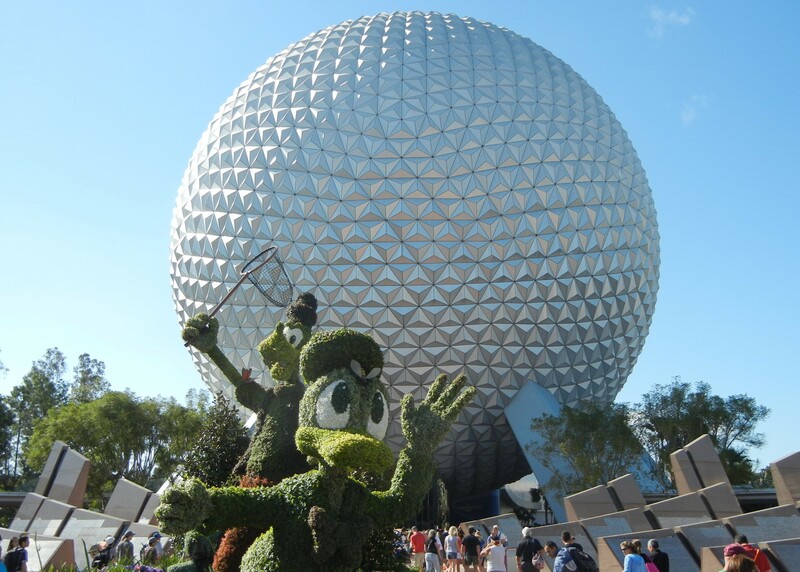 Future World West includes Soarin', Captain EO, Character Spot and The Seas with Nemo and Friends, while Future World East is home to Innoventions, Test Track, Mission Space and the iconic, spherical centerpiece of EPCOT known as Spaceship Earth. It's a Ball World, after all. The best part of Future World; however, is Coca-Cola's Club Cool. It's a perfectly located oasis on the outskirts of Future World where guests can replenish themselves with exotic colas from all over the world before diving into the World Showcase. The multiple, self-serve fountain drinks are free and offer guests the opportunity to experience a familiar beverage with a culturally different taste. It's almost like a fun game of Taste-Bud Roulette, in that one of the eight drinks will most likely taste like battery-acid. But as they say, one man's battery acid, is another Italian man's coke... called Beverly. Basically what I'm saying is, the one called Beverly tastes like anti-freeze and smells like nail polish remover. It definitely wasn't my cup of tea, so try it at your own risk. Go back to Italy, Beverly. Most young adults don't even bother with Future World. They get in the park and make a bee-line for the World Showcase – well-aware of where their future leads: the bottom of a beer stein at Germany's Biergarten. 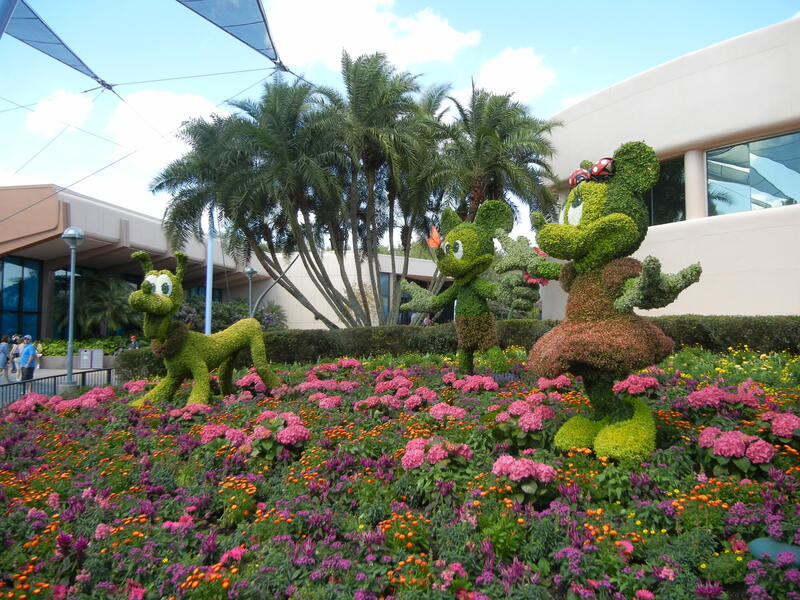 The World Showcase is a semi-circle of culture comprised of eleven official countries. In order from left to right is Mexico, Norway, China, Morocco, Germany, Italy, America, Japan, France, England and Canada. Before jumping in; however, you have to decide which way to go: clock-wise or counter-clockwise. Which country you start with says a lot about you as a person. Do you play it safe and naturally just go left to right, or are you a renegade that goes against the grain? Perhaps you do it World War II-style by taking a ferry boat to the Germany Pavilion and then flipping a coin to decide which country to invade? The options are endless. 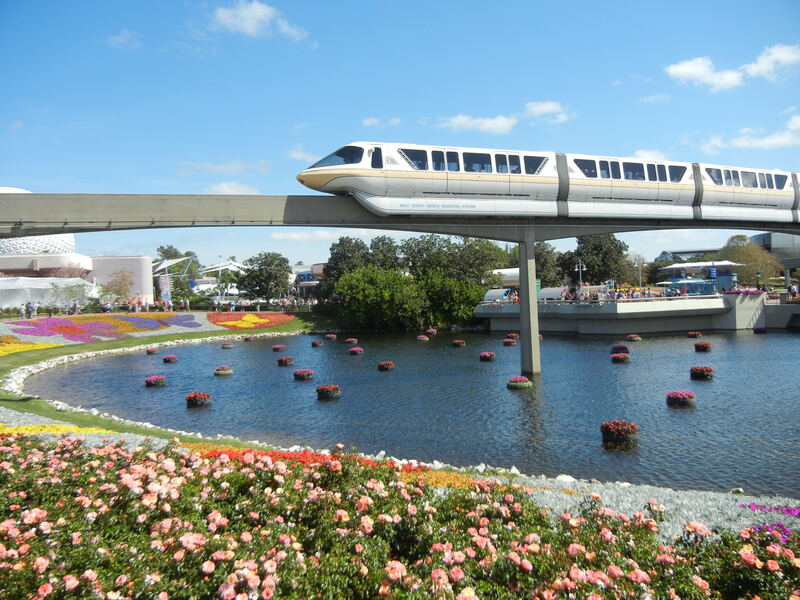 Ultimately, you have to ask yourself two questions: are you at EPCOT to entertain your kids and look at flowers or are you at EPCOT to drink around the world? If it's the latter, then you're heading right and grabbing a Labatt Blue in Canada on your way to England's Rose & Crown Pub. That is unless you like kicking off your EPCOT fiesta with some Mexican cervezas South of the Border. 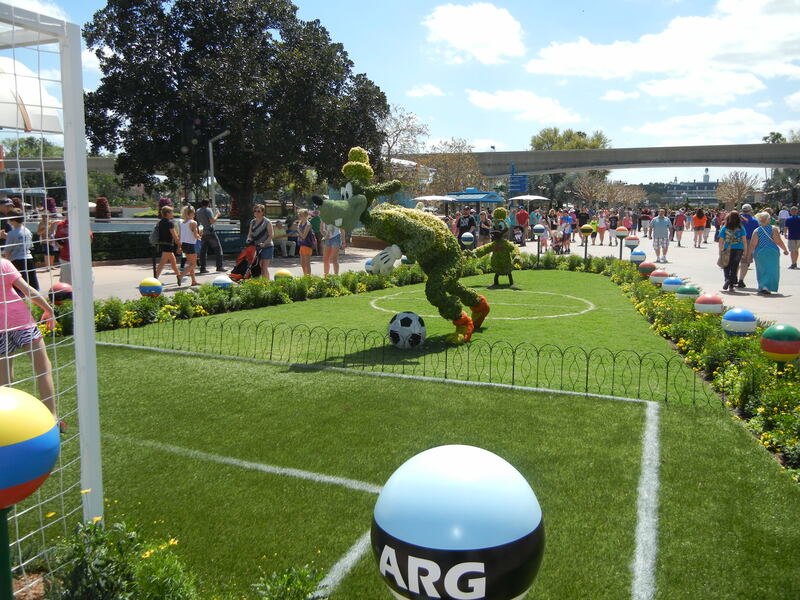 For those entertaining kids, Disney/Pixar's Monstrous Playground is located on the Imagination Walkway, just before the right side entrance to the World Showcase. 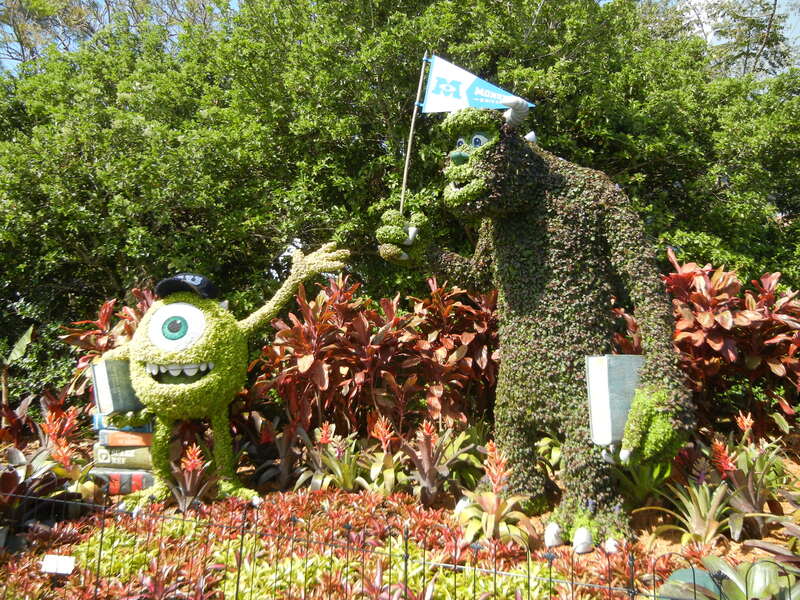 The shaded, Monsters University-themed attraction is divided into two age-appropriate jungle gyms. Surrounding the twin play areas are benches and comfortable seats, so parents can relax in the shade while their kids run around. The nearby Tinkerbell's Butterfly Garden is a peaceful, net-covered attraction filled with plants and fluttering butterflies that fans of the little pixie will love! Also, if you're at EPCOT with kids, then you are absolutely taking a left into the World Showcase and heading straight towards Norway to get in line for the Frozen meet and greet with Anna and Elsa. By the time we got there, the wait time was three hours and some change. Sorry girls, we'll wait a few months until the attraction gets moved to the Princess Fairytale Hall at the Magic Kingdom, and then we'll FastPass Plus it. Unfortunately, there is no FastPass Plus for the beer line. Disney recognized what truly draws large crowds to their annual Food & Wine Festival, and looked to replicate that success in the spring. With the addition of outdoor kitchens serving food and beer, The EPCOT International Flower & Garden Festival has basically been transformed into Food & Wine Junior. For instance, the Pineapple Promenade – a staple of EPCOT's wildly successful fall festival – not only offers Flower & Garden guests the deliciously unique Sweet Potato Cinnamon Waffle, but they also serve a Tropical Mango Pale Ale, as well. Likewise, every country features a different cultural delicacy and adult refreshment to wash it down. No EPCOT Festival is complete without some classic rock or golden oldies! The American Pavilion hosts the Flower Power Concert Series which invites popular bands and artists from the 60s, 70s, and 80s to play that one song from that one thing each Saturday at 5:30 pm, 6:45 pm and 8 pm. I'm a huge oldies fan and was able to catch The Orchestra Starring Former Members of ELO. The massive group released a number of catchy and experimental tunes back in the day, and they played them all during each of their three, hour-long sets. Hits like "Mr. Blue Sky," "Telephone Line," "Livin' Thing," and "Evil Woman" had the crowds (both seated and those standing in line for the next show) singing out loud. Guests can also rock-out each night in the England Pavilion to British Invasion tribute band, British Revolution, or they can get painted up like the Ultimate Warrior and go full-on metal like this guy to the kilt-wearing, bagpipe-rocking, Off Kilter near the Canada Pavilion. There was a time when I thought EPCOT was nerdy. I mean, c'mon; Innovation, Technology, Culture? Now, EPCOT is my favorite Disney Park – mostly because of the World Showcase, awesome music, food and drink festivals, and yes, because it's the only place where you can successfully Drink Around The World. It may not have become the utopian community of the future that Old Uncle Walt envisioned it to be, but no matter what time of year, EPCOT is always EPIC! Oh, and the flowers are pretty, too.